Comprehensive report on adult students and college completion. Sections include: demographics, marketing and outreach, institutional services, promoting academic success, and strategic partnerships. Published June 2015. 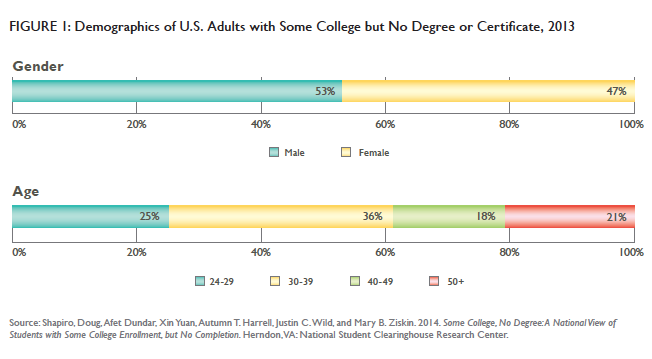 Interest in adult college completion, both for adults with some college credit and those who have never before attended college, has dramatically increased across the higher education community. This report draws from the considerable body of recent research focused on various populations of adult learners, including data gathered during Higher Ed Insight’s recent evaluation of Lumina Foundation’s adult college completion efforts. The goal of the report is to synthesize what has been learned about the needs of adult college students, particularly those returning to college after stopping out, as well as to identify areas where further inquiry is needed in order to demonstrate effective ways to support degree completion for adults. Erisman, Wendy and Patricia Steele. “Adult College Completion in the 21st Century — What We Know and What We Don’t.” Higher Ed Insight. June 2015.